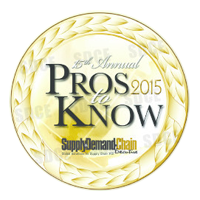 Supply & Demand Chain Executive, the executive's user manual for successful supply and demand chain transformation, is pleased to announce the 15th annual listing of Pros to Know in the Supply Chain industry. Supply & Demand Chain Executive recognizes Provider Pros and Practitioner Pros (including Teams). The Provider Pros to Know is a listing of individuals from a software firm or service provider, consultancy or academia who have helped their Supply Chain clients or the Supply Chain community at large prepare to meet the significant challenges in the year ahead. This year's list includes more than 200 Provider Pros to Know. The 2014 Green Supply Chain Awards recognize companies making green or sustainability a core part of their supply chain strategy, and are working to achieve measurable sustainability goals within their own operations and/or supply chains, in the areas of Sourcing/Procurement, Fulfillment/Logistics, Operations, Product Lifecycle Management, and other areas of the supply chain. 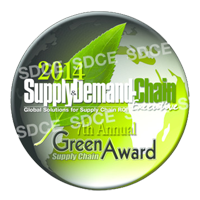 The awards also recognize providers of supply chain solutions and services assisting their customers in achieving measurable sustainability goals. The awards highlight companies that are making sustainability a core part of the businesses and supply chain strategies. And they have the results to show for it. Almost 200 submissions were received through an open nomination process. Wynright named to Robotic Business Reviews 2014 Top 50 most notable companies in the global robotics industry. The RBR50 is a list of the most notable public and private companies in the global robotics industry. The RBR editorial team and an advisory council select the RBR50 based on factors such as innovation, groundbreaking application, commercial success and commercial potential with an eye towards representing many different levels and facets of the robotics industry ecosystem. 2013 NextGen Game Changer Award. Awarded to the company with the most revolutionary up-and-coming robotics products. Elk Grove, IL, October 29, 2013 – Confirming its industry-leading position as a developer of innovative solutions, Wynright Corporation, a wholly owned subsidiary of Daifuku Webb and a leading U.S.-based provider of intelligent material handling systems, has been named the winner of the NextGen Game Changer Award for its Robotic Truck Unloader (RTU). 2011 Steel Joist Institute Design Award, Industrial Application. Awarded for unique joist usage in massive mezzanine for SKECHERS USA. Elk Grove, IL, October 11, 2011 – Wynright Corporation, the nation’s leading independent, U.S.-based provider of intelligent material handling systems, has received the Steel Joist Institute’s 2011 Design Award. The much coveted award was presented to Wynright Structural Solutions for the design, manufacture and installation of a 135,000 square foot mezzanine erected in SKECHERS USA’s 1.8 million square foot warehouse in Moreno Valley, CA. Presented with Most Notable Robotics Innovation for unparalleled, fully automated, Robotic Truck Loader. The RTL is Wynright’s autonomous robotic truck loader. It integrates state-of-the-art robotics and scanner technologies, 3D mapping, and controls to autonomously drive into and safely load a truck/container. Circumventing the use of pallets, the RTL provides optimal shipping space, and improved loading efficiencies to fully "cube" a truck.